Last night I visited Bryn Oh‘s sim Immersiva to explore her new work: Lobby Cam. An interactive ‘installation’ and as all her works it is very photogenic. You land in a museum-like hall/room where Bryn’s works are on the wall. You can pick up the free HUD, which you will need if you want to do the exploration : find collect pages of a diary and read the complete story on Lobby Cam. To get into the actual sim requires some patience, you will need to find the entrance yourself – I am not going to spoil it! I wandered around, through the endless fields of wheat and enjoyed the view very much!. 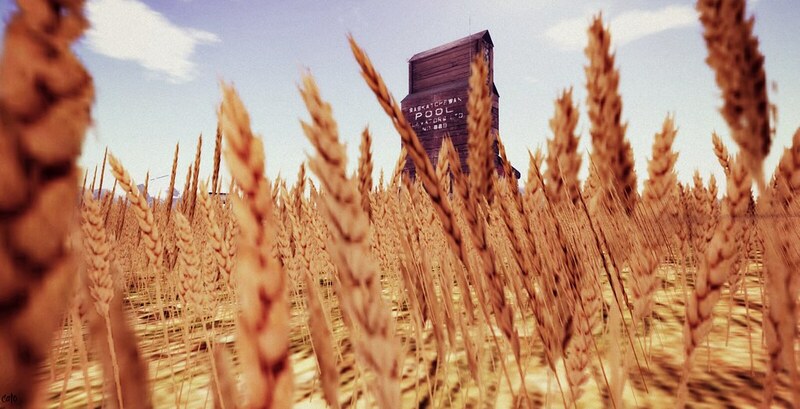 The wheatfields wave with the wind, this makes the place a bit of a challenge for less powerfull machines, but Bryn has given some tips and tricks on how to reduce your lag, near the landingpoint/HUD giver. I found some pages, but did not have enough time to complete the diary, so I will have to go back! In one case Bryn helped me out grabbing the page I found, for some reason it would not let me get it…! Besides doing the ‘hunt’ for the diary pages, the place is magnificent for pictures! I always love wide panoramic views and that is what this is all about, gorgeous! oh wow, loved the entrance!